For those willing to brave the long, steep, and windy drive, it’s a wonderful lake to explore. On the other side of the concrete barrier in the road, the obvious, unsigned trail takes off to the right and heads into an oak forest. Oaks give way to pine, then open shrubs and limited views of Cherry Lake below. It climbs for 2mi/3.2km to the old Kibbie Ridge trailhead. Here the trail is much more open as it switchbacks up the ridge. The grade eases as it gets up on the ridge. 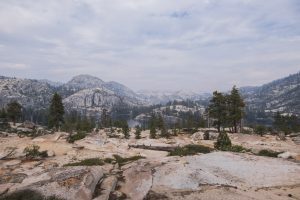 The trail enters into Yosemite National Park and descends into the valley with a wet area that can be buggy in the spring. From here to the crossing of Kibbie Creek, the trail passes through a morphing mosaic of tall shrubs, dry manzanita, forest and boulder fields. Granite walls and boulders become more dominate as you wander up the valley. Just before the creek crossing, a social trail veers off to the left which leads to the west shoreline and better views of the lake. The official trail fords the creek (a “rock hop” in the spring, but dry later in the year) and heads up through a path blasted into the rocks. This trail takes you through the trees to the shoreline at the very south end of the lake, offering a nice look at a few islands in the lake and the cliffs that line the lake’s eastern edge. Trailhead: Take the Cherry Lake Road located east of the Big Oak Flat Entrance off Highway 120. Follow the steep and windy road for approximately 23mi/37km to the Cherry Lake Reservoir. Cross over the dam and take a left up the dirt road to the parking area at the end. The narrow road is not recommended for RVs.